The horses were led to water and everyone drank…. Before we dig into what may be the most important story about the riots, looting and protests in Ferguson Missouri we want to make one thing very clear. We are not taking a position on whether or not the Micheal Brown shooting was totally justified. The facts are that there are multiple conflicting witnesses on both sides, people are rushing to judgment and there has been disinformation coming from both sides. For Example: some reports said that Brown was shot in the back and the autopsy proved that was not the case. Other reports said that Officer Wilson suffered an eye socket fracture and now that has been refuted. It is going to be some time before we have a more complete picture of what happened on that day, if ever. What we are certain of however is that fear, mistrust and agitation have been fueled by both “sides”. While some have acted responsibly, powerful Democrats and activists with deep roots into the current Democratic Party leadership are the ones burning this candle at both ends. It has been the playbook of the left to destroy the American melting-pot (E pluribus Unum), by agitating any differences among Americans. Rich vs poor, black vs white, lack vs Latino, management vs labor; all are used to divide and conquer. Democrats are empowered by promising justice to both sides. This playbook has been spelled out in detail by in countless books and publications by the left from the Communist Manifesto, to the works of Vladimir Lenin, the scholarly research of Cultural Marxism by the Frankfurt School (which invented multiculturalism and political correctness), to the current Democratic Party campaign playbook, Rules for Radicals by Saul Alinsky. Instead of dealing with the low hanging fruit first such as the agitation of Al Sharpton lets look at those who runs state and local politics in Missouri. 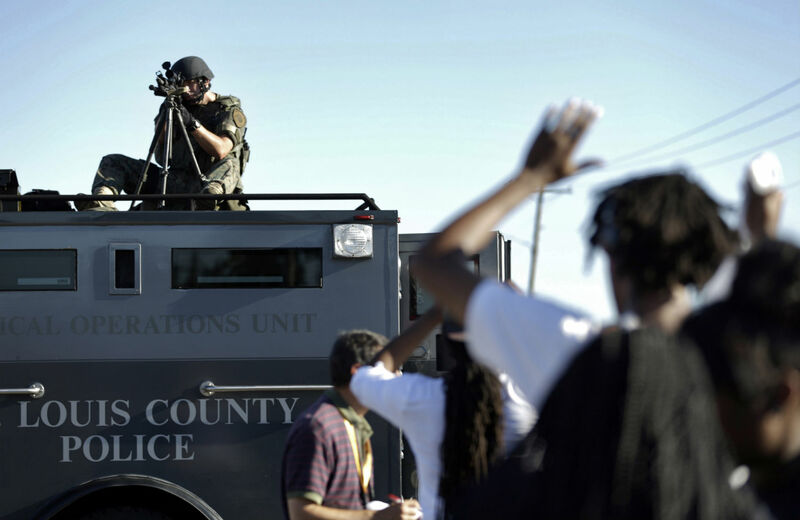 How has local law enforcement been politicized in recent years? Missouri Governor Jay Nixon put out his infamous MIAC Report with the Missouri Highway Patrol which lumped people who are pro-life, oppose illegal immigration, TEA Party activists and veterans as terrorists along with skinheads and anti-semites. Prosecutors and sheriffs from across Missouri are joining something called the “Barack Obama Truth Squad.” Two high-profile prosecutors are part of the team. We met them this afternoon in the Central West this afternoon. They are Jennifer Joyce of the city (and) Bob McCulloch, the St. Louis County prosecuting attorney. They will be reminding voters that Barack Obama is a Christian, who wants to cut taxes for anyone making less than $250,000 a year. They also say they plan to respond immediately to any ads and statements that might violate Missouri ethics laws. The threat here is not veiled at all. Work against the election of Barack Obama and you will gain the undivided attention of police and prosecutors. This is also where Kenneth Gladney, a 38 year old black men who was selling political buttons and shirts to make a living at political events, was beaten on video by SEIU thugs working in league with the Democratic Party. St Louis law enforcement and prosecutors were not interested in filing charges until public pressure grew and then the prosecution was so unaggressive that in spite of having the video which shows what happened, the SEIU thugs were acquitted. Governor Nixon at first was critical of St Louis authorities, all Democrats mind you, saying that police, by selectively releasing bits of information were trying to besmirch Micheal Brown, then Gov. Nixon said that he wanted a vigorous prosecution of the officer involved, even going so far as to say that there “needs to be justice for the family of Micheal Brown”. Now Gov. Nixon says that the officer might not face any kind of trial at all. It get’s better. The prosecutor and chief investigator Bob – Obama Truth Squad – McCulloch’s “father, mother, brother, uncle and cousin all worked for the St. Louis Police Department, and his father was killed while responding to a call involving a black suspect”. Local community leaders have asked McCulloch to recuse himself because of the apparent conflict of interests. McCulloch has refused to recuse himself and Governor Nixon, who promised that justice, is standing by McCulloch. Who needs agitators like Al Sharpton when you have a crew like this undermining all confidence in the process? (Paraphrasing) Sure I do, there should be a trial, but there is a double standard. If someone from my community shoots an unarmed man he will get locked up and then there will be a trial to give him a chance to be prove himself innocent. When they kill us they don’t get locked up, most of the time there is no trial, nothing. Agree with the protestor’s interpretation of the system or not, to the average man on the street the protestor makes a good point. There appears to be two justice systems, one for those in power and another for his community. Reason Magazine reports that 50% of Americans believe that police are not held accountable for their misconduct. That number rises to 64 percent for Hispanics and 66 percent for African Americans. Local police, who’s training and actions are under the jurisdiction of the very well connected Democrats mentioned above, have not inspired confidence and instead have accomplished rather the opposite. To be clear we are not anti-police by any means but facts are facts and the behavior of local police controlled by Democrats for decades speaks to the problems in St Louis County. Further undermining public confidence, as thugs looted police were ordered to stand down leaving store owners on their own. Police also targeted journalists which has resulted in multiple lawsuits under Missouri’s Sunshine Law. At least one of the attacks on a news crew was caught on video. The raw statistics of Ferguson Police under the control of our inclusive and tolerant Democratic Party friends also do not inspire confidence. 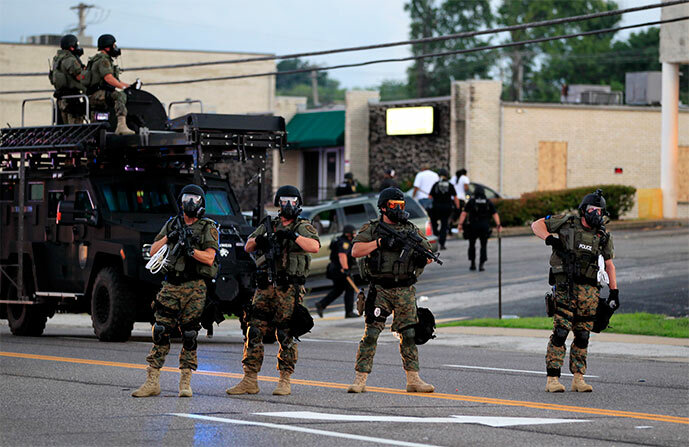 While over 67% of Ferguson’s population is black only three of its 53 police officers are. Traffic stop statistics show that 86% of traffic stops are black drivers. One member of the Ferguson City Council is black and zero members of its school board are. Here is a statistic that anyone would find maddening, 19% of Ferguson’s general budget comes from traffic fines and court fees. 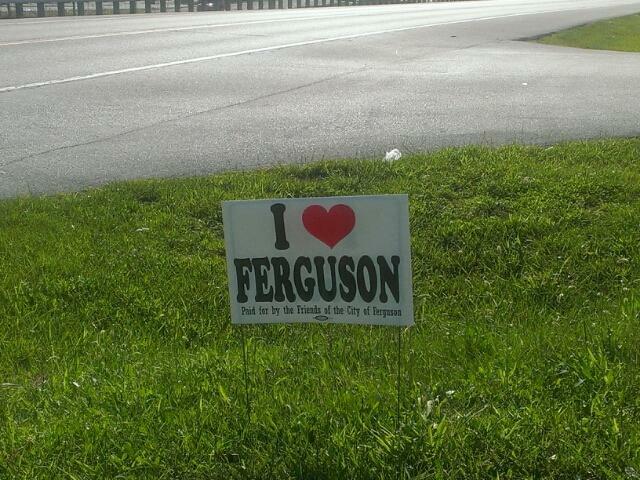 For profit policing has always disproportionately affected the poor and in a community like Ferguson it means blacks. It will be interesting to see how Democrats attempt to find a way to blame non-existent Republicans in Ferguson or St Louis for this. All of this and more has prompted Attorney General Eric Holder to launch a full DoJ investigation of his own. We wish this development would inspire confidence. Remember that Holder is responsible for sending guns to Mexican drug cartels in an effort to blame American gun owners for the violence that ensued. Holder Has politicized the voting rights division and protected the Black Panthers as they showed up armed to the polls to help insure that only Obama supporters voted. 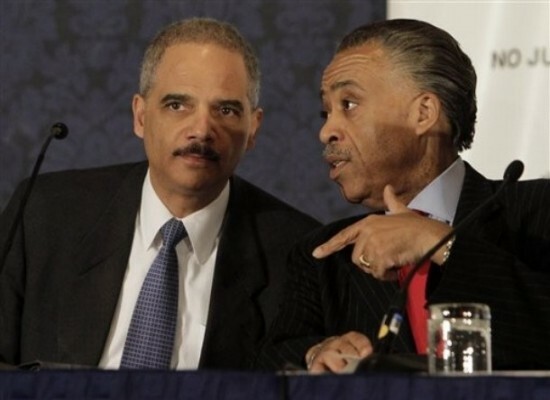 Eric Holder launched a non-existent investigation into illegal IRS targeting of grass roots political groups and 47 government Inspector Generals have sent a letter of protest to Congress stating that the Obama Administration is getting in the way of justice. Eric Holder’s Justice Department is also responsible for the intimidation and illegal spying on journalists. Some are already openly asking if Eric Holder intends to railroad the police officer involved in the shooting for political reasons. Government officials and those in their employ are not the only ones agitating. Several elite media networks have been shameful in their provocative and over the top coverage of Ferguson in an attempt to generate conflict and thus ratings. Rather than report the news last week, the mainstream media instead chose to create news in Ferguson, Missouri with 24/7 race-baiting, outright lies, stupidity and urbanite ignorance. Which now brings us to Al Sharpton. Politico reports that Al Sharpton is the White House’s man on the ground in Ferguson. Aside from Al Sharpton’s long history of bogus racial incitement and hoaxes, what does NBC think it is accomplishing with allowing Sharpton to be a player at creating news events in Ferguson while covering those same events on his nightly MSNBC program? All pretense of fairness, accuracy and objectivity is out the window. Alveda King, niece of slain civil rights icon Dr. Martin Luther King, said that where Al Sharpton goes unrest escalates. Speaking of unrest, agitators from Chicago were spotted in Ferguson inciting violence including Black Panthers and members of the Chicago Revolutionary Communist Party all of which have close ties with the Saul Alinsky inspired “community organizers” of the Chicago political machine which President Obama had worked with for years. Other self admitted revolutionary communists with relationships with the White House include Bill Ayers, Van Jones, Frank Marshall Davis(2), and Reverend Jeremiah Wright (2). It is always the goal of those who seek power to control both the establishment and the opposition. Those in the leadership of “all/both sides”, in apparent opposition to each other, all have a long chummy relationship with a segment of the leadership of the Democratic Party. In the mean time black unemployment and labor participation are hovering at record lows, our inner cities are disaster in spite of trillions in new spending that promised to fix it, inner city schools are the quintessential example of failure. The Conference of Mayors reports that American jobs pay 23% less than they did before 2008 totaling $93 billion in lost wages.